Opera News has called Anthony Davis, "A National Treasure," for his pioneering work in opera. His music has made an important contribution not only in opera, but in chamber, choral and orchestral music. He has been on the cutting edge of improvised music and Jazz for over three decades. Anthony Davis continues to explore new avenues of expression while retaining a distinctly original voice. Mr. Davis has composed five operas. X: THE LIFE AND TIMES OF MALCOLM X with a libretto by Thulani Davis, had its world premiere at the New York City Opera in 1986. A recording of the opera was released in 1992 on the Gramavision label and earned a Grammy nomination for music composition. UNDER THE DOUBLE MOON, with a libretto by Deborah Atherton, premiered at the Opera Theatre of St. Louis in 1989 and TANIA, an opera based on the kidnapping of Patty Hearst with a libretto by Michael John La Chiusa, premiered at the American Music Theater Festival in 1992 was recorded and released for KOCH International in October of 2001 and received its European premiere in Vienna in November, 2003. His fourth opera, AMISTAD premiered at the Lyric Opera of Chicago on November 29th, 1997. AMISTAD was created in collaboration with librettist Thulani Davis and was directed by George C. Wolfe. AMISTAD was presented in a new production directed by Sam Helfrich at the Spoleto USA Festival in June, 2008. A recording of AMISTAD was released on New World Records in October, 2008. Anthony Davis' opera WAKONDA'S DREAM with a libretto by Yusef Komunyakaa debuted with Opera Omaha in March 2007. He is also collaborating with director Robert Wilson, writers Alma Guillermoprieto and Charles Koppelman and Cuban composer-percussionist Dafnis Prieto on a new opera about the Cuban Revolution that was presented in workshop with Los Angeles Opera in September, 2008. A new chamber opera LILITH based on Allan Havis' play will debut later this year at UC San Diego's Conrad Prebys Music Center . He has two music theater works in development, SHIMMER, a music theater work about the McCarthy Era with Sarah Schulman and Michael Korie and TUPELO, a music theater work about the life of Elvis Presley written with Arnold Weinstein. He has composed numerous works for orchestra and chamber ensembles commissioned by the San Francisco Symphony, Brooklyn Philharmonic, Atlanta Symphony Orchestra, St. Lukes Chamber Ensemble, Kansas City Symphony, and the Massachusetts Institute of Technology. YOU HAVE THE RIGHT TO REMAIN SILENT, a clarinet concerto for the Perspectives Ensemble premiered at Miller Theater in New York in 2007. 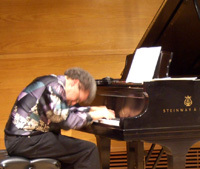 Most recently, the La Jolla Symphony presented the premiere of his Amistad Symphony in February of 2009. His other works include the music for the critically acclaimed Broadway production of Tony Kushner's ANGELS IN AMERICA: MILLENIUM APPROACHES, PART ONE which premiered in May, 1993 and PART TWO, PERESTROIKA which debuted in November of 1993. He has written two choral works. The first, VOYAGE THROUGH DEATH TO LIFE UPON THESE SHORES, an a cappella work based on the poem "Middle Passage" by Robert Hayden, is a harrowing tale about the slave trade and the fateful Middle Passage. His work, RESTLESS MOURNING, is an oratorio for mixed chorus and chamber ensemble with live electronics. The work sets the poetry of Quincy Troupe and Allan Havis as well as the 102nd Psalm and addresses the 9-11 Tragedy. The piece was performed by the Carolina Chamber Chorale and premiered at the Piccolo Spoleto Festival on May 31st, 2002. A graduate of Yale University in 1975, Mr. Davis is currently a professor of music at the University of California, San Diego. In 2008 he received the "Lift Every Voice" Legacy Award from the National Opera Association acknowledging his pioneering work in opera. In 2006 Mr. Davis was awarded a fellowship from the John Simon Guggenheim Foundation. Mr. Davis has also been honored by the American Academy of Arts and Letters, the New York Foundation of the Arts, the National Endowment of the Arts, the Massachusetts Arts Council, the Carey Trust, Chamber Music America, Meet-the-Composer Wallace Fund, the MAP fund with the Rockefeller Foundation and Opera America. He has been an artist fellow at the MacDowell Colony and at the Rockefeller Foundation's Bellagio Center in Italy.